On this episode of the Comics Alternative’s Young Readers series, Gwen and Krystal discuss two new releases: Tory Woollcott and Alex Graudins’s The Brain: The Ultimate Thinking Machine, the most recent volume in First Second Books’ Science Comicsseries, geared towards upper elementary and middle grade readers, and Jarrett J. Krosoczka’s Hey, Kiddo: How I Lost My Mother, Found My Father, and Dealt with Family Addiction, a YA comics memoir, published by Scholastic’s Graphix imprint. To introduce Woollcott and Graudins’ The Brain, Gwen and Krystal talk about non-fiction, informational comics for young readers, bringing up other volumes in the Science Comics series, such as M.K. Reed and Joe Flood’s Dinosaurs, as well as Maris Wicks’ Human Body Theater, and Gene Luen Yang and Mike Holmes’ Secret Coders. Gwen explains that all of these texts place scientific or mathematical information within a fictional frame, and she summarizes the basic premise of The Brain, which places two sisters, Fahama and Nour, in a setting that is reminiscent of wacky 1960s and 1970s monster films or TV shows like The Munsters. Krystal praises Woollcott and Graundin’s use of a diverse cast, both in terms of the principal characters and of the individuals who appear in illustrations of the way that the brain impacts human functioning. Both Krystal and Gwen detail some of the memorable spreads in the comic and view the text as an excellent story and reference book for young readers. Next, the two PhDs move on to a young adult graphic memoir, Jarrett J. Krosoczka’s Hey, Kiddo, which is already earning critical acclaim and award buzz (it is a National Book Award finalist). Krosoczka is well-known as the author of nearly a dozen picture books and of the Lunch Lady graphic novel series, but Hey, Kiddo is his first YA offering. Gwen recommends Krosoczka’s 2012 TED Talk “How a boy became an artist,” as well as his 2014 TED Talk on the Lunch Lady comics. Both provide insight into Krosoczka’s childhood influences and artistic choices. Krystal then gives a detailed description of the way Hey, Kiddo mirrors — and expands upon — many of the artist-focused coming of age narratives that have been popular in recent decades, including Alison Bechdel’s Fun Home: A Family Tragicomedy (2006) and Özge Samanci’s Dare to Disappoint: Growing Up in Turkey (2015). Krystal also applauds Krosoczka’s use of line style and color in commenting on memory, and Gwen testifies to the author’s ability to evoke a convincing depiction of 1970s New England. Both reviewers love this text and highly recommend it for teens and adults. The Young Readers series will be on hiatus in December, but Gwen and Krystal will be back in January with a look at some of the YA graphic novel highlights of 2018. The Comics Alternative extends a warm welcome to Paul Lai, who has taken over from Andy Wolverton as co-host with Gwen Tarbox on the Young Readers show. Everyone at The Comics Alternative family will miss Andy’s wise and engaging reviews and perspectives on children’s and young adult comics. In their first show together, Gwen and Paul discuss the newest volume in First Second Books’ Science Comics series, Falynn Christine Koch’s Bats: Learning to Fly, as well as Ru Xu’s fiction (“diesel-punk,” as Paul terms it) graphic novel NewsPrints, published by the GRAPHIX imprint at Scholastic Books. Since its launch in 2016, the Science Comics series has included volumes on coral reefs, volcanoes, and dinosaurs. Geared towards upper elementary and middle school aged readers, Science Comics take advantage of the elements of visual storytelling to put forward scientific information. As the editors point out: “With the increasing ubiquity of visual information,” young readers need to “learn to process and respond to visual content, and comics are an incredibly effective medium for exploring visual literacy.” Regular listeners to the podcast may remember that Gwen and Andy reviewed Dinosaurs by M.K. Reed and Joe Flood in their March 2016 YR show, and many of the elements that they praised, including the accessibility of scientific information, as well as the use of humor, appear in Koch’s volume, as well. Bats: Learning to Fly encourages young readers to understand the important role that bats play in the ecosystem, to overcome their fear of bats, and to learn how they can become involved in protecting and caring for bats. In addition to providing a great deal of information on various species of Bats, Koch creates a narrative in which a teenage girl, Sarah, volunteers at a bat rehabilitation center after her parents overreact to a bat and injure it. Lil’ Brown, as the bat is known, is both a character in that narrative and a narrative presence in his own right, as he directly addresses the reader at various points regarding his own anatomy and role in the ecosystem. As part of their discussion, Paul and Gwen consider how young readers might respond to the way information is imparted in the comic, and they look forward to Koch’s upcoming volume for the Science Comics series, Plagues: The Microscopic Battlefield, due out in August, 2017. Koch recently graduated from the Savannah College of Art and Design (SCAD), and Gwen and Paul discuss how her precision drawings and humor-filled text combine to create a text that will delight readers, while encouraging them to appreciate how they can play a role in scientific study by volunteering to rehabilitate bats or building bat houses for their backyards. Next, Gwen and Paul discuss another debut comic from a SCAD graduate. NewsPrints is written and drawn by Ru Xu, a comics creator who was born in Beijing, immigrated to Indianapolis as a young child, and has had a lifelong love of comics from a variety of traditions, including manga, European comics, and even superhero comics. NewsPrints takes place in a fictional diesel-punk world where the land of Nautilene is torn by war and a newspaper called The Bugle is the only media outlet left that is still reporting the truth. The protagonist, Blue, is a rare kind of newsboy in a society that counts on its newsboys to shout out the headlines and sell papers…and that’s because Blue is not a boy, but a girl, orphaned by the war and adopted by the family who owns the newspaper. 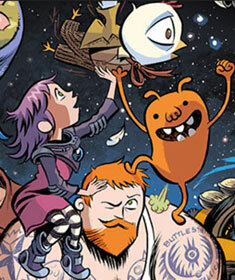 Blue sets out to provide that one doesn’t have to be a boy to be vital in the news business, and along the way, readers are introduced to a cast of characters such as Jack, the eccentric and secretive inventor; Crow, a strange kid who remains wrapped in a scarf and in mysteries of his own; and Goldie, Blue’s loyal canary, who matches Blue’s welcoming of people and spirit of flight. As part of their discussion, Paul and Gwen praise Xu’s mastery of many genres of comics, including her ability to meld various traditional forms into an entirely unique story world. Thus, while the text shares much in common with recent fantasy releases, including Faith Erin Hicks’ The Nameless City and Jorge Corona’s Feathers, NewsPrints stands on its own, with a vast, inviting story space and a focus on issues of truth and representation that are ever more a part of our own political and social climate. Paul praised Xu’s deft handling of interactions among characters, and Gwen expressed her admiration for Xu’s use of color and shading to help set the mood and to ease transitions across the comic. Given the book’s indeterminate ending, Paul and Gwen look forward to the series continuing into additional volumes, and they dwell on Xu’s treatment of gender and ethnicity in thoughtful ways. Comic News Insider Episode 678 – CNI v Batman v Superman! Comic News Insider: Episode 678 is now available for free download! Click on the link or get it through iTunes! Sponsored by Dynamic Forces. Jon Hoche makes it 3 weeks in a row as co-host! They chat about the Supergirl/Flash crossover in all of its adorableness and have a LENGTHY discussion/recap/review of Batman v Superman: Dawn of Justice. I mean LENGTHY. News includes: lots of DC Rebirth news, Elijah Wood will be the co-lead in BBC America’s upcoming Dirk Gently series, Peter Serafinowicz has been cast as The Tick in the upcoming Amazon live action pilot. and the Kingsman sequel will be called Kingsman: The Golden Circle and will take place in America. Leave your iTunes comments! 5 stars and nothing but love! Also, get a hold of us!